* b. Accept only recognized call. In this mode, all of the unknown calls will be rejected; those recognized calls (names are already stored in the phonebook/contacts) will be not affected. * c. Reject calls from blacklist.In this mode, all of the calls from the predefined blacklist will be automatically rejected, whereas the rest of the calls will not have any effect. An end user can make use of "Manage Lists" function to create the needed blacklist. This can be used in the situation when a user does not want to be harassed from some people. * d. Accept call from whitelist. In contrast to the previous one, in this mode, mobile only accept calls from the predefined whitelist. All of the other calls from non-whitelist will be automatically rejected. An end user may use "Manage Lists" function to create the needed whitelist. * e. Personalized call rejection. In this mode，an end user may define personalized call rejections for each of the members in the "Specific List". A user may select "Reject call", "Reply by SMS" or "Greeting" options to reject calls. A user may use "Manage Lists" to create his/her "Specific list". * a. 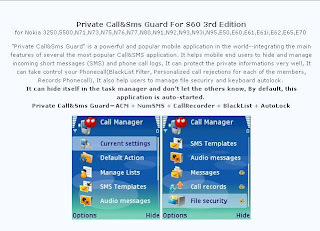 "PCG" can help to manage the SMS messages in the mobile phone to make the needed messages visible or invisible in the "Inbox/Sent" of the Nokia "Messaging" application. In this case, a user can hide the sensitive information even your phone is lost, or the user does not want to share the information with others. * b. An end user may create his/her "Baby list" using "PCG". Once the "Baby list" has been set up, in the next start-up of "PCG", it will automatically scan all of the existing short messages. If a message is to from the "Baby list", then messages will be automatically hidden. In addition, it can also automatically hide the short messages from "Baby list" if it is running. This will eventually protect the user's privacy since others cannot view the SMS without supplying a correct password. A user can set his/her password in "Active mode". When an SMS from "Baby list" comes in the mobile phone icon on the top-left corner of the screen will keep blinking until the user has entered the "Manage SMS" / "Call Records" area using "PCG". * All of the phone call records from "Baby list" will be automatically hidden. A user can ONLY view the phone call record by inputting a correct password. * When a call from one of the member in the "Baby list" comes in, if it is not answered, then a small "mobile phone icon" will keep blinking until the user enters either "Manage SMS" or "Call Records" area with a correct password provided. Whenever a call has been establish (in whichever user interface), if a user wants to record the caller's voice (for example, please tell me your phone number or your home address, then I can record it down), the user just simply needs to simultaneously press "ABC" key(on which has a pen icon) and "+" key, "PCG"will automatically invoke the "Recorder" application in S60 to record the telephony voice. As such, t the caller's voice and the user's voice will be recorded simultaneously. A user may the functions from the recorder to "Stop", "Pause" or "Continue" to record the voice. Note：For those S60 phones, which has the "QWERTY" keyboard layout，a user needs to use "CTRL+A" key combination to activate the telephony voice call recording. Currently, Nokia S60 E61 has the keyboard layout. When this function is used, all of the incoming calls will be automatically rejected. If the caller uses a mobile phone to make the call,then the caller may receive a customized SMS message. This is especially useful when a user does not want to be disturbed; however,he/she still wants the caller to get some information about the callee. A user may choose an SMS template like "I am driving call"or "I am having a meeting now, please do not disturb me"as a reply. A user may define his/her own "SMS Blacklist". In this case, all of the SMS from the blacklist will be automatically removed when the SMS message come in. This function is very useful when a user does not want to receive those harass SMS messages or advertisement SMS messages. A user may define a time interval for "Autolock time interval"。When keyboard is not used within the time, then "Call Manager" will help to lock the keyboard automatically. Except the time when a call is established, no matter whichever user interface a user is currently in, the user may simultaneously press "ABC" key(on which there is a pen)and "+" key to activate the quick key lock function. The benefit of this function is that a user does not to switch to the "Idle screen" in order the lock the keyboard. Another benefit of this function is that it can help us to quickly lock whichever screen. Note：1) For some of the S60 phones, when this quick key lock function is activated, after key lock is deactivated in the active idle screen, a user may not see the left/right soft keys in the screen. If this happens, a user may press any of the numeric keys in the phone to recover this situation, or a user may choose to use the S60 standard way ("left soft key" + "+" key) to activate the key lock function since this ONLY happens in the active idle screen 2) For those S60 phones, which have the "QWERTY" keyboard layout, a user must use "CTRL+A" key combination to activate the telephony voice recording。Currently, Nokia E60 uses the keyboard. A user may use the left and right soft key to browse the directories in the phone, and the user may choose the files to encrypt or decrypt. 10- Auto start enable By default, this application is auto-started.